Durable Victor Reinz® elastomer coatings use only high-quality fluoropolymers for micro sealing. Through controlled sealing pressure, these coatings fill and adapt to engine block and cylinder-head surface roughnesses, scratches, and porosities. By using global materials and design specifications, our sealing solutions are highly cross-linked for improved durability. 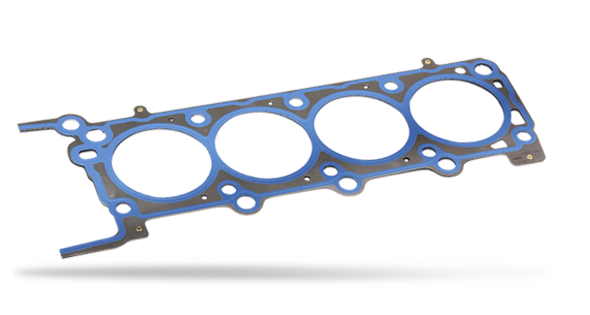 In this sealing process, the active spring steel layers of a multi-layer steel cylinder-head gasket are coated on both sides with thin, elastomer coatings for micro sealing between the individual layers. Withstanding temperatures of up to 240°C, it provides excellent chemical resistance toward aggressive media. Using up to 70 percent less coating material, partial coatings are only applied in the areas around the combustion chambers, liquid channel openings, and beads. Our process permits the application of several coatings with different physical properties and layer thicknesses. Partial coatings also provide robust sealing between the engine block, gasket, and cylinder heads.